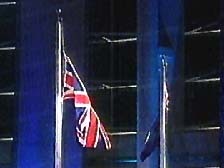 Here, the Union Jack and the colonial flag of Hong Kong were flown in the Convention Centre one last time. A wind generating machine within the Convention Centre operated to make sure the flags would flutter correctly. 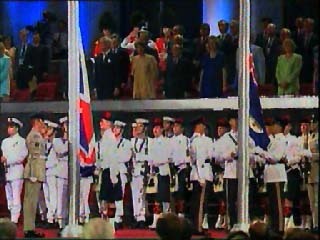 "God Save the Queen," the British national anthem, played one last time. Outside the Convention Centre, the Union Jack started to be lowered by members of the British armed forces: Army, Navy, Air Force, Marines. 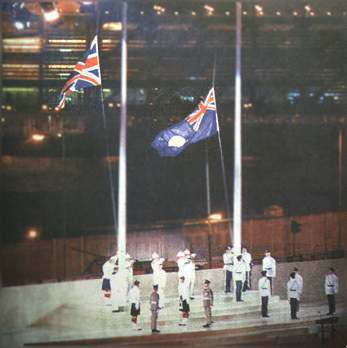 The colonial Hong Kong flag was brought down by members of the Royal Hong Kong Police. Inside the Convention Centre, the same thing was happening with the two delegations and the audience looking on.